I'm embarrased to say this but I didn't even know I had the Barefoot Roses fabrics that started this top. I have no idea when I bought them, or where, or why, but I have three different pieces, each at least a yard, so I'm sure I had a plan ... or found a good sale. I came across it yesterday and had to do something with it. I absolutely love it. I only wish I had more! It blended well with fabrics I had in my stash and I'm thrilled with the result so far. 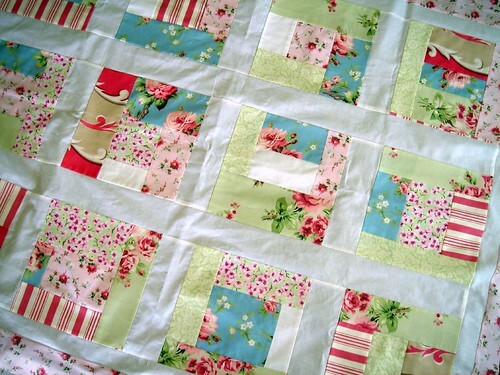 Basically, these are 9" foundation pieced pieces with white sashing and a white border, followed by a pink border. The binding will be the blue rose fabric. The second one began with the Pampered Pooch fabrics (which really aren't even visible in the above photo ... hmph), of which I had three. Before getting started I tried searching flickr for quilts or projects made from the line, just to get a few ideas and instead I found this awesome picture. I almost want a dog. Really, almost but not quite. This is pieced from 10" by 2.5" rectangles. 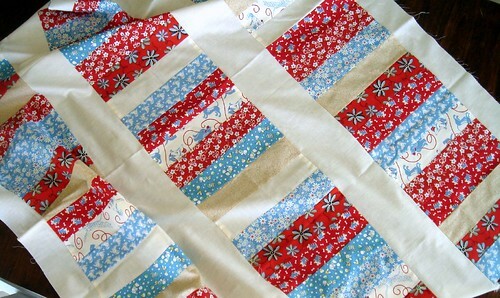 I then added 5" wide pieces of natural muslin between each row and 3" natural pieces for the outside sides. I haven't decided on a binding or back for this yet. Both of the tops are about 44" by 55", bigger than most crib quilts. I think I'm addicted to making quilt tops. I'd like to find a support group, not one to get me motivated to finish these quilts, but just a group of people like me who amass quilt tops like other people collect wine (um, yeah, that would be my husband). I had to take these pictures inside so the colors aren't the best. A swarm of bees landed in my next door neighbor's tree this morning and, while the bees are content to just hang in a pile on the tree, I'm not up for taking any chances. And I certainly can't send C. out to do it ... she gets stung by every bee (and wasp) within a mile of her ... they LOVE her. 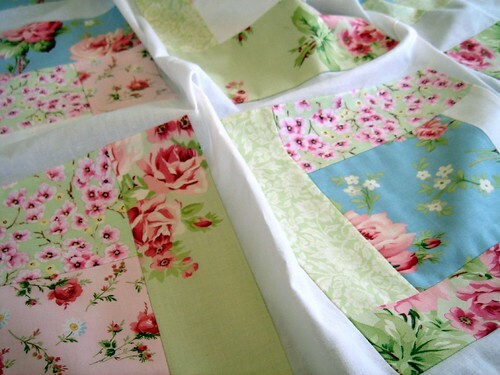 These are absolutely stunning - I love the Barefoot Roses quilt! Oooh I am loving those prints!! So pretty!! Hehe, those dogs are so flipping adorable too! 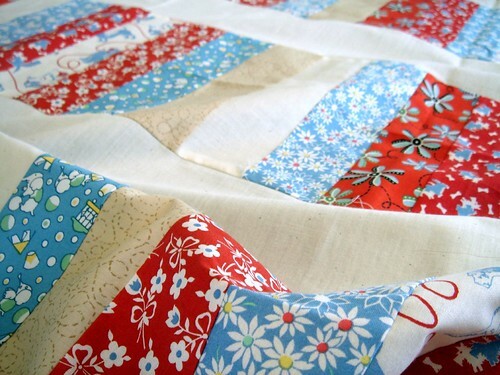 Your quilt tops are so lovely! Truly darling and beautiful. Hanging out with bloggers keeps each other motivated.